Analysis: Sen. Jeff Merkley has seized the Senate floor in an attempt to launch an old-school filibuster to block Judge Neil Gorsuch from getting on the Supreme Court. WASHINGTON — While you slept, for the past 12 hours and counting, Sen. Jeff Merkley, D-Ore., seized the Senate floor in an attempt to launch an old-school filibuster to block Judge Neil Gorsuch from getting on the Supreme Court. The Oregon lawmaker yielded the floor at 10:15 a.m. Wednesday — 15 hours after he began highlighting his party’s opposition to Gorsuch. 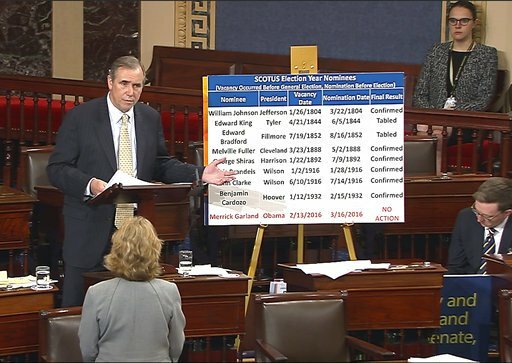 During his attention-grabbing talk-a-thon, Merkley stood next to a blown-up, poster-style portion of the Constitution with the words “We the People” showing. But his filibuster comes too late to be able to derail or even delay Gorsuch’s confirmation. In fact, it may not even technically be a filibuster. That’s because procedurally there’s nothing he nor his colleagues can do to stop Gorsuch from getting a vote on Thursday to advance his nomination – and, ultimately, not much they can do stop him from getting on the court. To understand why, we first have to understand the most accepted definition of a traditional filibuster. The Senate has no limits on how long a senator can talk. And once a senator gets talking, they usually cannot be interrupted or cede the floor without their consent. So, if this were a traditional filibuster, it means as long as Merkley (and other senators who join him) talk, they can hold up the Senate procedure. Except there is one thing that can force a talking senator to yield the floor. And it’s the one thing Senate Majority Leader Mitch McConnell, R-Ky., set in place Tuesday: A vote to end debate on Gorsuch. There aren’t many rules on how long a senator can talk, but there are tons of rules about how long senators have to wait to vote. For example, McConnell knew his colleagues in the minority were going to filibuster Gorsuch – either by actually talking, like Merkley is, or threatening to talk, like Senate Minority Leader Chuck Schumer, D-N.Y., has. So before anything began, McConnell filed a motion to vote to end that debate. That motion, called a cloture motion, has to wait two days before it is “ripened” and senators can actually vote on it. McConnell started the clock Tuesday on Gorsuch’s nomination. By Thursday, it will be time to take a vote on whether to end debate on Gorsuch. And taking a vote on Gorsuch is the one thing in Senate rules that can interrupt Merkley from his marathon speech – assuming he and his colleagues are still talking by that point. The vote Thursday will be a critical one for Gorsuch. His nomination is not expected to clear the 60-vote hurdle, thanks to nearly all Senate Democrats expected to vote against advancing his nomination. Once that vote fails, Republicans will likely start a process to lower the threshold for ending debate from 60 votes to a simple majority, effectively killing the filibuster for Supreme Court nominees. Because of this cloture rule that can interrupt any talking senator, Cornell Law University Professor Josh Chafetz says most filibusters over the past decade haven’t been filibusters in the true sense of being able to hold up Senate procedure – think of Texas Republican Sen. Ted Cruz’s 21-hour speech in 2013 ahead of a government shutdown. He ended the speech just as the Senate was about to vote on a spending bill. But if he had been talking, the vote that would have ended his speech for him. The purpose of a traditional filibuster can be twofold: To try to convince other senators of your point, or to delay proceedings. So what’s the purpose of talking when you know you’re not able to actually delay anything? Well, Merkley’s got us writing about him – and you reading about him – doesn’t he? From the perspective of a senator who’s got something to say, that’s probably worth staying up all night for.